Perverse Logic: Saving the Multiverse with Unhinged Cosmic Inflation! 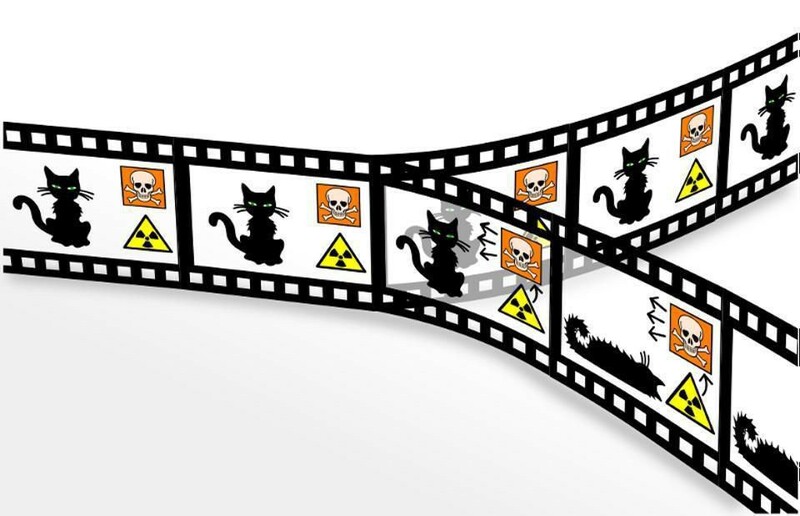 Ethan proposes to use cosmic inflation to provide for the proliferation of Schrödinger cats and Wigner’s friends. One folly would thus provide for the other, and they would thus stay up, like two drunks falling into each other’s arms. I will instead humbly suggest to do away with madness altogether. But first a little recap. The universe is expanding. This experimental evidence was established around 1920, by a number of astronomers in Europe and the USA, the most famous of whom was lawyer turned astronomer, Edwin Hubble. Hubble had the biggest telescope. The expansion is presumed to be looking everywhere the same, and this is what seems to be observed. That also means that, if one looks far away, galaxies will seem to be receding from us at speed ever closer to the speed of light. As the apparent speed of these galaxies approach c, their light gets shifted to lower and lower frequencies, until they become invisible (same reason as why Black Holes are blacker than black). Where the transition to invisibility occurs is called the “event horizon”. Beyond the event horizon is the unobservable universe (we can’t detect it gravitationally, as gravity goes at the speed of light, a theoretical prediction now experimentally verified). The observed universe is “flat” (namely there is no detected distortion in the distribution of clouds, filaments and superclusters of galaxies). That sounds unlikely, and indicates that the observed universe is a tiny portion of a much larger whole. There is no way for us humans to know, for sure, or not, what is going on beyond the observable universe (aside from having no gravitational field distortions when approaching the event horizon, as I said above when considering “flatness”). What Ethan is saying is that if a number of crazy (cosmic inflation), or incomplete (Quantum Field Theory), ideas are “all correct”, then something as useful as angels on pin heads is real.Yes, indeed, if one believes that Muhammad flew to Jerusalem on a winged horse (! ), one may as well believe all the rest of the Qur’an. That is a proof by crystal balls. After Ptolemy and company had established their (half correctly) predicting “epicycles” theory, one could have used it in turn to “prove” Aristotle ridiculous theory of motion. 23 centuries ago a much saner theory existed, that of Aristarchus. It was rejected at the time, precisely because it was not insane, and even though it was used to make a nearly correct prediction of the distance of the Moon. Aristarchus underestimated the distance of the Sun, but a telescope could have changed this (by showing more precisely the angle of the terminus on the Moon). If astronomers had the time had accepted heliocentrism as a possibility, it would have led them to invent the telescope. Similarly, right now, rejecting Many Worlds and Multiverse will lead to develop instruments which don’t exist yet (I have proposed at least one). Astrophysicist Ethan Siegel suggests that: “The Multiverse is real, but provides the answer to absolutely nothing.” My opinion is that the Multiverse is worse than useless: the unhinged mood it provides prevents to develop more fruitful avenues of research, both theoretically and experimentally. Insanity is the rule in crowds (Nietzsche). Thus follies are the truths crowds love, at first sight, before being corrected by higher minds. Why? Follies bind, because they are so special. In Aristarchus’ times, heliocentrism, the fact Earth and its Moon rotate around the Sun, should have been obvious. Indeed, people, let’s think for a moment: where was the Sun supposed to be, considering the phases of the Moon? If the Sun turned around Earth, the Moon’s illumination should have changed all day long! It didn’t require much geometrical analysis to discover that this source of light could only be where Aristarchus computed it to be, far away from the Earth-Moon system. It took 19 centuries to correct that (obvious!) mistake. Interestingly, Jean Buridan, circa 1350 CE, did it in the most theoretical fashion. Buridan first showed that Aristotle’s ridiculous theory of motion made no sense, and had to be replaced by inertia and momentum (what Buridan called “impetus”). Having done this, the motion of the planets in a heliocentric system could be explained by “circular impetus”, Buridan pointed out (then he observed sardonically that we couldn’t observe the difference between epicycles and heliocentrism, so may as well go for “Scripture”). Similarly, nowadays, instead of arguing with the “angels on a multiverse pinhead” authorities, we better point out to the glaring inconsistencies of Quantum Mechanics. Civilization without reason is like a chicken without a head: it can run, but not forever. 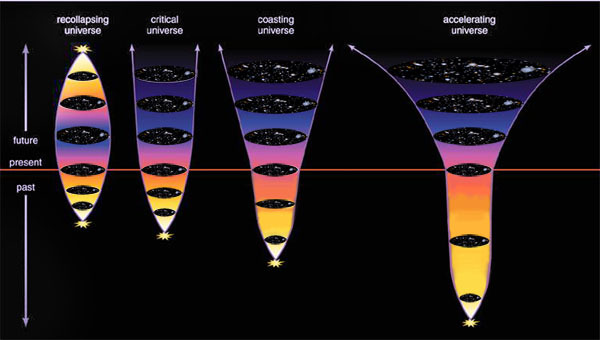 “Multiple teams of scientists can’t agree on how fast the Universe expands. Dark matter may unlock why. 20 years ago it was peer-reviewed published, by a number of teams that we were in an ever faster expanding universe (right). The Physics Nobel was given for that to a Berkeley team and to an Australian team. There are now several methods to prove this accelerating expansion, and they (roughly) agree. Notice the striking differences between different models in the past; only a Universe with dark energy matches our observations. 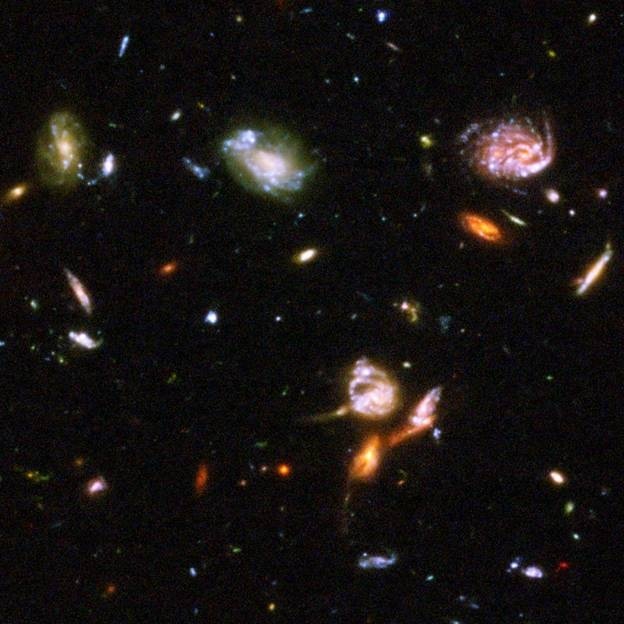 Possible fates of the expanding Universe which used to be considered were, ironically enough, only the three on the left, which are now excluded. Image credit: The Cosmic Perspective / Jeffrey O. Bennett, Megan O. Donahue, Nicholas Schneider and Mark Voit. Vacuum energy, like a cosmological constant, is energy inherent to space itself, and drives the Universe’s expansion. (This idea comes back to Einstein who introduced a “Cosmological Constant” in the basic gravitational equation… To make the universe static, a weird idea akin to crystal sphere of Ptolemaic astronomy; later Einstein realized that, had he not done that, he could have posed as real smart by predicting the expansion of the universe… So he called it, in a self-congratulating way, his “greatest mistake”… However, in the last 20 years, the “greatest mistake” has turned to be viewed as a master stroke…). Ethan: “At the dawn of 2018, however, the controversy over the expanding Universe might threaten that picture. Our Universe, made up of 68% dark energy, 27% dark matter, and just 5% of all the “normal” stuff (including stars, planets, gas, dust, plasma, black holes, etc. ), should be expanding at the same rate regardless of the method you use to measure it. At least, that would be the case if dark energy were truly a cosmological constant, and if dark matter were truly cold and collisionless, interacting only gravitationally. If everyone measured the same rate for the expanding Universe, there would be nothing to challenge this picture, known as standard (or “vanilla”) ΛCDM. The standard, oldest, method of measuring the Hubble cosmic expansion rate is through a method known as the cosmic distance ladder. The simplest version only has three rungs. First, you measure the distances to nearby stars directly, through parallax, the variation of the angle of elevation during the year, as the Earth goes around its orbit. Most specifically you measure the distance to the long-period Cepheid stars like this. 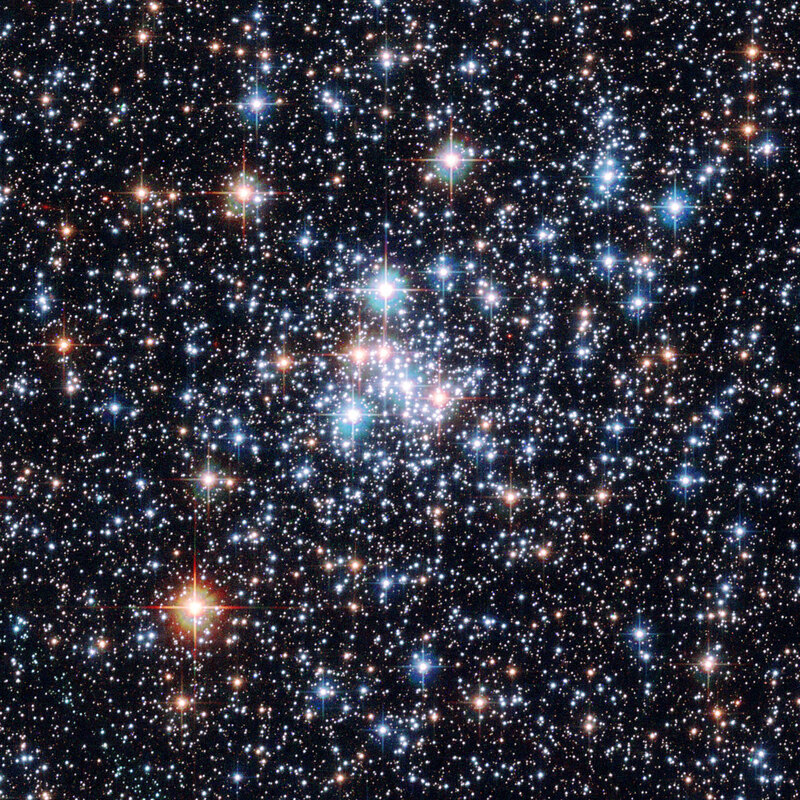 Cepheids are “standard candles”; they are stars whose luminosities vary, but their maximum power doesn’t, so we can know how far they are by looking how much they shine. Second, you then measure other properties of those same types of Cepheid stars in nearby galaxies, learning how far away those galaxies are. And lastly, in some of those galaxies, you’ll have a specific class of supernovae known as Type Ia supernovae. Those supernovae explode exactly when they accrete 1.4 solar mass, from another orbiting star (a theory of Indian Nobel Chandrasekhar, who taught at the University of Chicago). One can see these 1a supernovae all over the universe. Inside the Milky Way, as well as many of billions of light years away. With just these three steps, you can measure the expanding Universe, arriving at a result of 73.24 ± 1.74 km/s/Mpc. My own starting point is a revision of Quantum Mechanics: I simply assume that Newton was right (that’s supposed to be a joke, but with wisdom attached). Newton described his own theory of gravitation to be absurd (the basic equation, F = M1 M2/dd. where d was the distance was from a French astronomer, Ishmael Boulliau, as Newton himself said. Actually this “Bullaldius” then spoiled his basic correct reasoning with a number of absurdities which Newton corrected). Newton was actually insulting against his own theory. He said no one with the slightest understanding of philosophy would assume that gravitation was instantaneous. Newton’s condemnation was resolved by Laplace, a century later. Laplace just introduced a finite speed for the propagation of the gravitational field. That implied gravitational waves, for the same reason as a whip makes waves. We are in a similar situation now. Present Quantum Physics assumes that the Quantum Interaction (the one which carries Quantum Entanglement) is instantaneous. This is absurd for exactly the same reason Newton presented, and Laplace took seriously, for gravitation. Supposing that the Quantum Interaction has a finite speed (it could be bigger than 10^23c, where c is the speed of light. Supposing this implies (after a number of logical and plausible steps) both Dark Matter and Dark Energy. It is worth looking at. But let’s remember the telescope (which could have been invented in antiquity) was invented not to prove that the Moon was not a crystal ball, but simply to make money (by distinguishing first which sort of cargo was coming back from the Indies). We have one experimental find: the Cosmic Radiation Background (CRB), a uniform light from all over the sky at 2.7 degree Kelvin. I will argue that, on the face of it, it has three possible causes. However only one is considered to be true, and is consequently explored to death. That is, as if the lives of physicists depended on it. In truth, it’s only their careers that depend upon it. A theory nearly everybody believes in, is the “Big Bang”. After all, it’s in the Bible. The Bible is popular, thus, so is the “Big Bang”. As behooves something so big, it’s supposed to explain everything, for example why there is a Cosmic Radiation Background, why there is Helium, etc. Olbers’ reasoning was simple: 1) suppose the universe is infinite. 2) thus looking anywhere around the sky, once gaze is bound to end on the surface of a star. 3) therefore the sky ought to be uniformly bright according to the brightness of the average star. However, pointed out Olbers there was no uniform brightness. Now one such uniform cosmic light has been found, though, nobody seems to remember Olbers’ name. Olbers’ reasoning is inconvenient. Indeed, ever since Maxwell, we have established that light is electromagnetic radiation. So the Olbers Paradox could very well show up, not as visible light, but as a weak radiation. Why? Well, suppose that distant parts of the Universe recede, as Hubble and his predecessors and colleagues observed: the light from distant stars would shift into the very deep infrared… As observed! However, now that the Olbers Paradox has become the Olbers Effect, it’s used to explain something else completely different, and outright weird: the Big Boom. Instead of being the light of distant stars (or the like), as Olbers would have had it, the Cosmic Radiation Background (CRB) is viewed as the light from… an explosion. We see the expansion, we see the stars, we see the galaxies, do we see the explosions? And the question then appears: what happened to the initial Olbers Paradox? Why does nobody talk about it anymore? Could it not be that the Cosmic Radiation Background is even boosted the Olbers Effect with, say, tired light? Why are these sort of natural, historically laden questions not addressed anymore? The answer is simple: take Princeton University’s Physics Department. All professors there are string theorists. Problem: strings don’t exist. So these people are professors of inexistence. No wonder they can’t answer history. It’s true that theoretical considerations can lead to phenomenological interrogations. But string theory had its chance. By occupying all the theoretical space, it prevents other theories to have their chance too. Let’s change intellectual gears, and lift the debate into Meta. What we have here is one experimental find: the Cosmic Radiation Background (CRB), a uniform light from all over the sky at 2.7 degree Kelvin. We have three possible explanations, yet only one is pushed and pushed and pushed. That’s not the proper scientific method. To figure things out, we have to look everywhere, and make sure that logical branching points have been explored. OK, governments do not give enough money to do that. They prefer hedge fund managers and Google clowns. In the age when robots can replace most work, it’s time to reconsider this. Why? Why is it so important to get the universe right? Well, be it only because by doing so, we make our intelligence more subtle. In Bangladesh, the sea is now rising more than 16 millimeters per year, threatening one hundred million people. And nobody knows why. Perfecting our ability to observe and make theories is our essence. And no better place there is to perfect it than the entire universe. On a more aggressive meta level, to understand fanaticism, and the related intellectual fascism is urgently needed. In this respect the entire field of physics, as the self described most clever people in the world can be exposed to be complete fools. Remember the TOE? The Theory Of Everything? Well, as we now know, physicists have theories on, at most 4% of the universe. And those are obviously incomplete. But that’s another story. In the same vein, maybe they have only a 4% explanation of the Cosmic Radiation Background. Those who are honest enough, and clever enough, will admit that may well be true. No honesty in matters intellectual, no intelligence. Hawking’s claim to fame has been to show that, considering what we held to be true in physics in 1970, Black Holes are not really black. So it’s not surprising that he wants to advertise that fact. Basically Quantum Field Theory assumes that there are (“virtual”) pairs of particle-antiparticle that come into existence, not long enough to be observed directly, but long enough to change (“renormalize”) the Field (whatever the “Field” is). These quantitative changes are observed, so these “virtual” pairs are assumed to exist. Does it look dark to you? As stuff falls into Black Hole (see the “threads”in the real picture above), immense energy is gathered by the fall (as in a hydroelectric plant), and then most of it is thrown back out as violent radiation. As you can see, the Black Hole is not black at all. Actually the giant Black Holes at the core of galaxies are periodically exploding with greater force than hyper novas. And that means that life in many volumes of the galaxies has not possibility to evolve in sophisticated forms as we did. 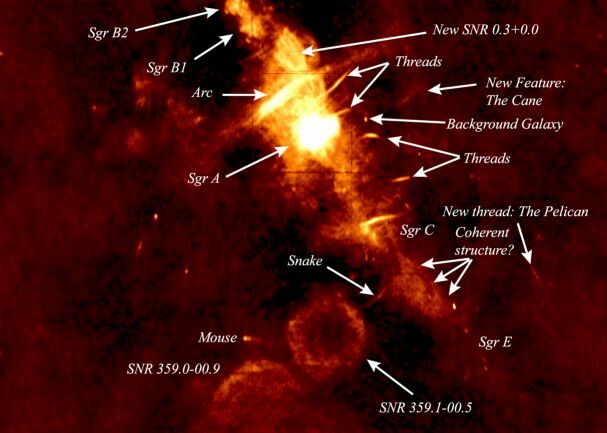 A whole cloud is expected to fall into our giant Sagittarius A*, within weeks). Even in Black Hole theory itself could be wrong: it’s full of holes, I demonstrated grandly once to a prestigious audience at Stanford (Yau, Susskind, Penrose were in the audience among other celebrities). I was looked at as cows watch a high speed train. In the meantime, though, Black Hole theory has become decidedly gray, and, decades later, many of these celebrities became famous for precisely what I talked about. First. (That little feat did nothing for my career, indeed, as this opinion, that Black Holes were full of holes, was viewed as thoroughly iconoclastic at the time). The kind Matt Strassler, in his excellent blog, got all excited about Hawking’s latest pronouncements. “Media absurdity has reached new levels of darkness with the announcementthat Stephen Hawking has a new theory in which black holes do not exist after all. Equations are just very precise sentences, nothing more, nothing less. They are not the Golden Calves. Equations are crucial to distinguish two exquisitely close theories (as in BH physics… to be distinguished from BS physics). However, not only equation fetishism, but exquisitely precise physics can itself become a trap, if the conceptual foundations of the theory are wrong. Some have said that equations are necessary to validate concepts. That, too, is wrong. The best known example of precise, but erroneous theory is the geocentric theory. It became a prisoner of its precise mathematics (Fourier analysis in disguise). It took 19 centuries (Kepler) to make the math of heliocentrism precise enough to contradict geocentrism (but Kepler’s mentor, Tycho was handsomely financed because he had a hunch that ancient astronomers had cheated, especially about Mars). Earlier, Buridan (1320 CE) had contradicted Aristotle, by discovering inertia (“Newton’s First Law”), and pointing out that it made heliocentrism as valid as geocentrism (but for the little problem of “scripture”…. the specialists of which put all of Buridan’s work at the “Index of Prohibited Books”, a century after his death… Although he was part of mandatory teaching in Cracow, where Copernic studied…. thanks to Hus, earlier burned to a crisp, alive, by the highest cardinals). Ideas are more general than equations. Equations, like sentences, are written with concepts (root: becoming pregnant)… and pre-conceptions. “Shut up and calculate” goes only that far (my gaze is turning towards “superstrings”). “Equations are not just precise sentences, they are precise *quantitative* sentences. Equations are how you figure out if your concepts are right or wrong, by comparing them to empirical reality. It’s easy for you to sit here with all that history behind us and say that they should have just realized that ellipses were the right concept to begin with, but it’s only obvious to you because of the precise math that went into showing that this was indeed the right concept to describe reality. Anon: I did not say ellipses were easy to figure out, nor that concepts can be dissociated from equations. Ellipses were not easy to figure out. Kepler tried something like 100 different curves. However, clearly Buridan knew that the heliocentric theory was right. Heliocentrism is no more about ellipses than Kepler’s theory was about the 1/d in gravitation. Kepler mad a “30 year war on Mars” (as he put it). And he won. However, he believe erroneously, that gravity went as the inverse of the distance (instead of the inverse of the square of the distance). A French astronomer got the 1/dd, and Newton exploited it. The point is: theories have degrees. Geometry did without equations until Bolyai and Lobachevsky. Even then, the (re)”discovery” of Non Euclidean geometry was, fist of all, a philosophical phenomenon, the realization that geometry was a local computation, or modelization. Riemann’s shattering ideas were in a paper (Habilitationsschrift)… With just one (sort of) equation. His paper was all about concepts, including some erroneously attributed to Einstein. Speaking of Einstein (Matt started it, see above) his Special Relativity work of 1905 was just a neat repackaging of what was already known (that means Einstein 1905 strictly did not have ONE new equation). Considering the history of the last 5,000 years of science, Descartes having invented algebraic geometry less than 4 centuries ago, to equate science and equations is unwise. And soon to be irrelevant, thanks to computing power. After all, equations are digital, and the universe is not. An inkling of this: there is a field called combinatorial topology. General topology (which is… more general) does not rest on numbers. Ironically the Black Hole problem is all about Quantum Topology (we don’t know what that is, the crux of the problem). It gets better than that: the essence of the Incompleteness Theorems of mathematical logic is precisely that any formal expression belongs to a countable world… And the universe does not. To which I have added the further twist that the available energy if finite (and that obviously impact expressions, hence computations). Theory is hard, but it is the law. Of nature.